GN Solids America LLC is the major exporter from China and conduct business relationship over 75 plus countries around the world and keep gaining. We manufacture Mud Solids Control System & Drilling Waste Management. 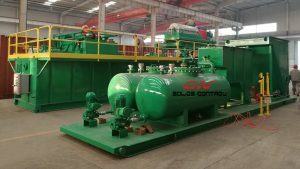 GN have the full line of machinery for Solids Control Solution of your oil gas drilling, CBM drilling, HDD, and water well drilling as well as the construction drilling mud treatment. GN Owns a its facility for making composite shaker screens. GN products is certified by DNV CE for Europe and TP TCfor Russia. GN management system for manufacturing comply with the HSE system ISO 14001 and ISO 28001 to ensure you with safest products. GN Solids America LLC manufacture oil drilling equipment including shale shakers and its wear and tear parts. Shale shakers is the solids-filter machinery that remove drill cuttings from the drilling mud that is used for digging holes into the earth. Filtering the solids in drilling mud is an important component of the operation cost of drilling, so research and development into shaker functioning is ongoing. GN Solids America’s shale shaker design – Shale shakers consist of large, flat wire mesh screens for filtering or sieves of various mesh sizes that shake or vibrate the drill cuttings. 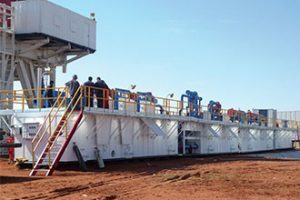 The commonly filter across and off of the shale shaker screens as the drilling fluid (mud) flows through them and back into the drilling fluid system. This separates the solid drill cuttings from the fluid so that it can be re-circulated back down the well bore for keep the drill bit functioning. Poor boy degasser’s design purpose is for treating big volume of dissolved gas in the drilling mud. Such gas under the pressure will be expand if not take care it properly. The poor boy degasser in traditional throttle pipe and between the vibrating screen and it has a direct discharge of gas pipeline. The installation of poor boy degasser is typically installed in the rear of the throttle manifold. Through field operation feedback, the capacity of gas process on poor boy degasser need to be five time as much as the design cycle. The inner diameter of the pipeline need to be same or larger than the coke manifold in the inlet pipeline of the poor boy degasser. 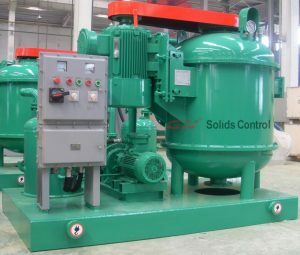 The drilling fluid is directly discharged into the inlet manifold of the vibrating screen or the reserve tank of the drilling fluid. The diameter of the exhaust should be 8 inches or greater. The valve should not be installed on the gas discharge line. The gas from the separator must be firmly fixed. During the cold weather the poor boy degasser installed on the bottom of the cleaning valve, in order to prevent liquid from blocking the liquid gas separator, the valve should be opened. GN Solids America LLC is user-friendly driven manufacture. We will try our best to assist your business to be successful. 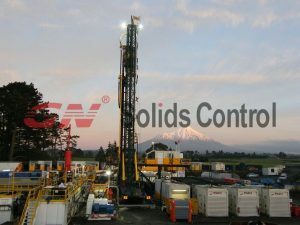 Welcome to visit www.gnsolidsamerica.com and please send your inquiries . Each and every year, we will update our brochure, just before the CIPPE exhibition in March. Now here comes the 2017 edition. Do not worry, we stick with our principle, quality first, price second, and as the first API certified solids control company, every year, API have anual inspection, and we passed. As a developing company, a lot of things also have been updated, hope something interests you. Lots of equipment have been updated to the new version, which means, details have been improved. Thank you very much for your feedback if you did, or you whatever you will let us know in future. Now shale shaker have updated to the 6th type, overall dimension, shaker screens is replacable with Swacom Mongoose, we also have our new shaker GNZS703F series updated. Hmmm, if you come to the booth, you will learn more about all the NEWS.